Dinosaur Comics - April 7th, 2008 - awesome fun times! –Hah hah, yeah, sorry about that! April 7th, 2008: A few days ago T-Rex was considering the "ninja teens" / "ninja teams" issue in the Teenage Mutant Ninja Turtles theme song. 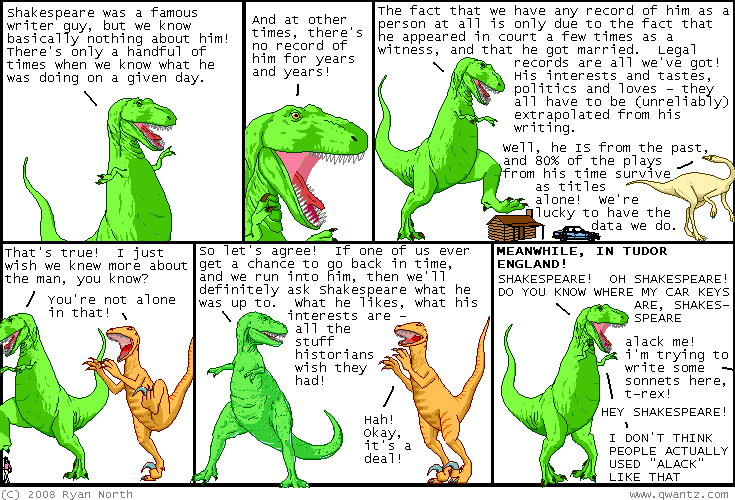 I got a lot of emails about that (and here it is nice to be able to say "Man, it's not me that's wrong, it's T-Rex!") but SECRETLY, I agreed with T-Rex, and thought that the lyrics says "Splinter taught them to be ninja teams". But guys! I am going to admit that I was wrong. Here is the fantastic blog post, by linguistics grad student John, that turned me around. It turns out the answer to this debate is (as in most things) to simply Ask The Chinese. In other news, there's a fun interview with me in the latest issue of Comics Foundry, and I say "fun" because they asked me questions and then printed just my answers, which makes me look like I'm volunteering a lot of information and have a lot of neat things to say. I rate this format five out of a possible five stars! This is only the second issue of Comics Foundry and it's fantastic: they've come miles since the first issue, and the insides are all on this nice full-colour stock. It's sort of like Wizard magazine, only with more content and less of a focus on HAY MAN LOOK AT THESE BREASTS HERE, LOOK, BREASTS, THIS IS IMPORTANT. Plus they teach you how to dress like Jimmy Olsen, which is a dream I never realized I had but now really want to make come true. So check it out! You can subscribe on their site, and Midtown Comics has issue two alone for sale here. Finally, I wanted to announce that I'll be at ROFLCON April 25th and 26th! This is going to be an insane convention where they've collected all these internet people and academics and put them in a room together. You should come! I see registration is now closed, but they expect to have a few more spots open up as the date approaches. Seriously, look at this guest list. It is basically a short list of people I would like to meet and say "i like your website", scuffing my feet on the ground, all bashfully. One year ago today: astute readers will notice that t-rex is defending his joke by trying to argue that the stereotype is true. a risky gambit!